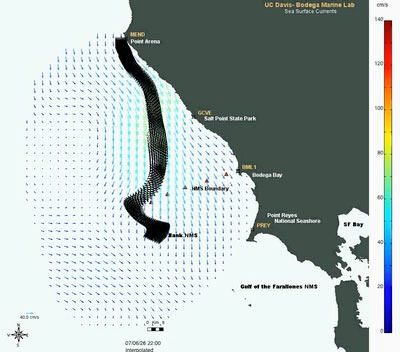 This animation demonstrates the nutrient-rich waters that support the exceptional production in Cordell Bank and Greater Farallones sanctuaries flow from north to south. Any pollution on the ocean surface is carried south by the prevailing surface currents. Any animal that is unable to swim against the prevailing current would also be carried southward. Animation courtesy of UC Davis Bodega Marine Lab. NOAA has expanded the boundaries of Cordell Bank National Marine Sanctuary (CBNMS) and Gulf of the Farallones National Marine Sanctuary (GFNMS) to an area north and west of their old boundaries, and amended and added new regulations. NOAA also revised the corresponding sanctuary terms of designation and management plans. NOAA considered the comments received during the public comment period in order to revise the final GFNMS (PDF, 3MB) and CBNMS (PDF, 2.4MB) management plans, final environmental impact statement (PDF, 14MB), and the final rule (PDF, 318KB). The environmental impact statement published in the Federal Register on Dec 19, 2014, followed by the final rule on Mar 12, 2015. The action is effective after a review period of 45-days of continuous session of Congress. Read the press release or visit the media resources page for more information. 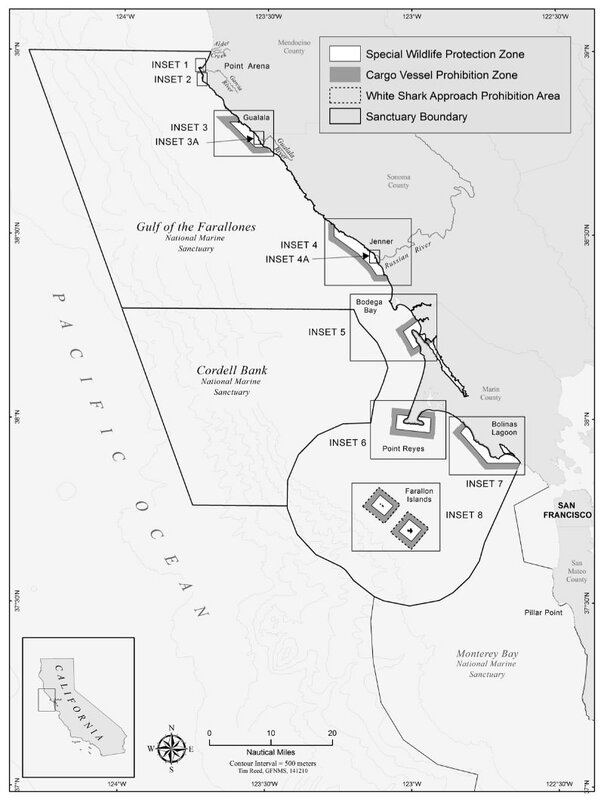 The sanctuary expansions encompass the nutrient rich upwelling zone originating off Point Arena and flowing south into the original sanctuaries. Given the existence of historically important ship and aircraft wrecks in the expansion area, and the keen public interest in these resources, it is a priority for the sanctuaries to continue their efforts to inventory and document this maritime heritage. As part of the National Environmental Policy Act (NEPA) compliance process for the expansion, the NOAA Office of National Marine Sanctuaries West Coast Region consulted with the California's State Historic Preservation Officer (SHPO), as required under Section 106 Review of the National Historic Preservation Act (NHPA). This consultation process allowed for a 30-day review process by SHPO and also provided the public with an opportunity to review and comment on the documentation. Read the Section 106 consultation letter (PDF, 779KB) and subsequent findings (PDF, 57KB). 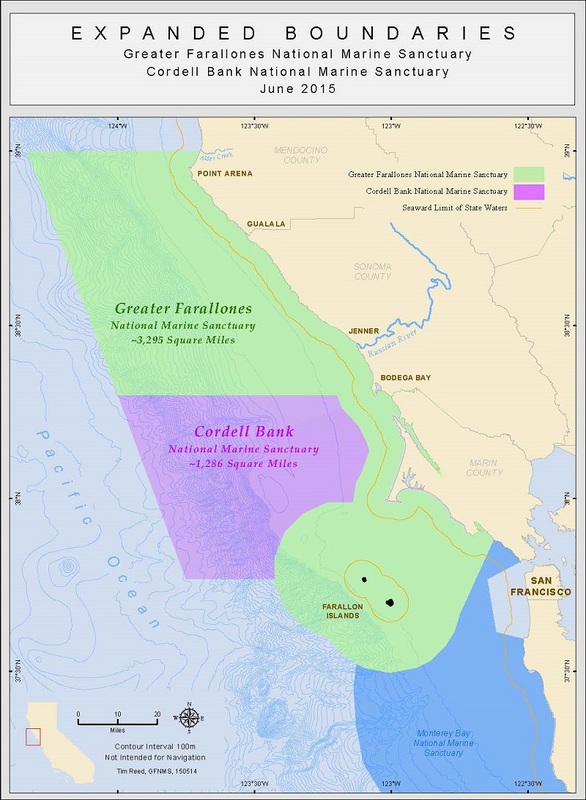 This map shows the expansion of Greater Farallones from approximately 1,282 square miles to approximately 3,295 square miles, and Cordell Bank from approximately 529 square miles to approximately 1,286 square miles. The GFNMS expansion area extends from Bodega Bay in Sonoma County to Manchester Beach, at Latitude 39 North a few miles north of the Point Arena Lighthouse in Mendocino County (excluding Arena Cove and all rivers and estuaries), including both state and federal waters. The CBNMS expansion, all in federal waters, extends west and slightly north of its current boundary to protect important subsea features such as Bodega Canyon. The boundaries will take effect after a review period of 45-days of continuous session of Congress.